This helps if you can't get the screen/display on your device to flip or rotate. If Portrait Orientation Lock is turned on, your screen won't rotate. Access the Control Center by touching the top-right corner of any screen then dragging downward. Tap the Portrait Orientation icon para activar. When the icon is highlighted in red, the Portrait Orientation Lock is turned on. If you don't see the Portrait Orientation icon, and your iPad has a Side Switch, view this info. Portrait Orientation Lock is turned on when the Portrait Orientation Lock icon is highlighted in red. Tap the Portrait Orientation Lock icon to turn off. Allows you to control Portrait Orientation Lock with the Side Switch. 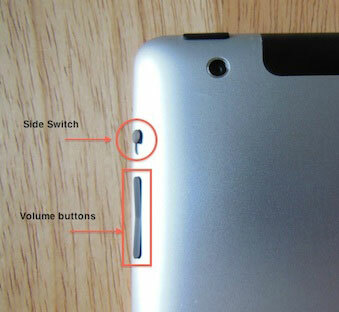 To identify your iPad model, view this info. From a Home screen, tap Settings icon . From the 'USE SIDE SWITCH TO' section, tap Lock Rotation.